Aha! So it wasn’t “unimportant” after all. It was a “vigorous procedure” with “plenty of teeth”. When you consider that the 1850 Fugitive Slave Law effectively made the federal government slavecatcher-in-chief, and that it prohibited federal officers who were holding alleged fugitive slaves from letting them go free, it can be seen that this law could indeed lead to armed conflict between the federal government and a “sheriff’s posse” made up of “all the able-bodied citizens” of an anti-slavery community. In fact, it could be called a state-sponsored rescue! So let’s look at how it played out in the Battle of Lumbarton. The action began on May 27, 1857 in Mechanicsburg, Ohio, when a U.S. Deputy Marshal and his posse arrested four citizens for violating the Fugitive Slave Law by allegedly helping a fugitive slave to escape. The Marshal and his posse then headed out cross-country with their prisoners towards Cincinnati. Word spread rapidly of the arrest, and a county judge issued a writ of habeas corpus ordering the county sheriff to bring the prisoners before him, so he could determine if the arrest was lawful. The Clark County Sheriff, John Layton, gathered a posse and went after the Marshal and his prisoners. They caught up with them near South Charleston. Gunshots were fired, but apparently nobody was hit. Sheriff Layton, however, was severely beaten during the altercation by the U.S. Marshal and his posse. The Marshal then continued on his way, with his prisoners, while the seriously injured Sheriff was attended to by his comrades. Word spread once again, and a larger posse was gathered to pursue the Marshal as he and his entourage crossed into Greene County. This posse was led by Sheriff Lewis, who caught up with his quarry near Lumbarton (a.k.a. Lumberton). This time the U.S. Marshal surrendered without injury. Sheriff Lewis took the Marshal and his posse to Springfield and jailed them there for the assault on Sheriff Layton. The Marshal’s prisoners (the four Mechanicsburg men who had been arrested for helping a freedom seeker escape from slavery) were taken before a Judge in Urbana, who released them. The case of the U.S. Marshal and his posse, held in jail in Springfield, now came to a hearing before a United States District Judge, Humphrey Leavitt. 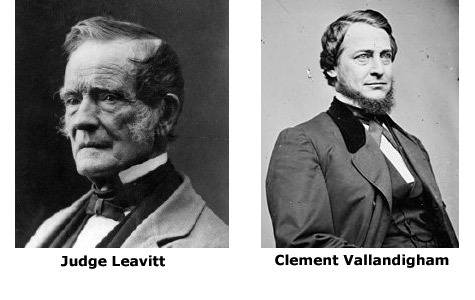 Arguing in favor of the Marshal was attorney and politician Clement Vallandigham, a Democrat. Arguing against the Marshal was Ohio Attorney General Christopher Wolcott, a Republican.